One of the most prominent strands of the Centre’s work in early music, coordinated by Paul Whittaker and Sally Harper, focuses on medieval cerdd dant, ‘the music of the string’ for harp and crwth. The main extant source of cerdd dant is the late medieval collection of harp music found in the ‘Robert ap Huw manuscript’ (British Library MS Additional 14905), copied in c.1613 but containing a far earlier repertory. This is one of the key sources of early Welsh music: it has long attracted the serious attention of both scholars (including Carl Dolmetsch and Thurston Dart) and performers (including Osian Ellis). 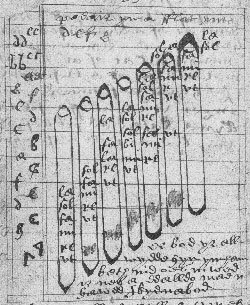 In recent years, CAWMS has led a significant advance in the understanding of the manuscript, its unique and ambiguous tablature and the resultant performance issues. Only one other 19th-century copy of a comparable source survives (British Library MS Add. 14970, copied by Iolo Morganwg). Paul Whittaker's 1974 thesis, 'British Museum, Additional MS 14905; An Interpretation and Re-examination of the Music and Text', remains a key work on the Robert ap Huw music and can be consulted here. The Centre has thus far hosted two specialist symposia on the Robert ap Huw manuscript (in 1995 and 2005), the first of which resulted in a special themed edition of the journal Welsh Music History, entitled Robert ap Huw Studies (Astudiaethau Robert ap Huw). This contains explorations of the history of the manuscript, its repertory, associated composers and compositional technique, the oral and aural tradition in which the music belongs, and its relationship to the Iolo Morganwg source. Further studies on aspects of the manuscript and the associated tradition may be found in subsequent editions of Welsh Music History. Other scholars and performers closely associated with this strand of the Centre’s work on the Robert ap Huw repertory include the early harpist William Taylor, the crwth player Robert Evans of Bragod, and the Irish harpist Paul Dooley (whose own website also contains useful information on aspects of the manuscript). CAWMS is also a warm supporter of the work of the independent researchers Bethan Miles and Peter Greenhill, whose important theses can both be consulted in the Centre’s Archive. CAWMS has also instituted an ongoing project on the wider aspect of cerdd dant and the associated theoretical sources. The diverse materials are currently being edited for a complete parallel text edition.